One of the major operas of Hunan, it is popular in central and eastern parts of the province, though Changsha and Xiangtan are the central points. The performance is lifelike and local. One ofthe major operas of 1 Hunan, popular inmost areas of the province. It has been developed from folk songs and ditties, and has a history of over 160 years. The performance is jocular, exaggerated and interesting. They have spread across the province and can be divided into three forms: high tune, level tune and low tune. The songs are all about love and romance. 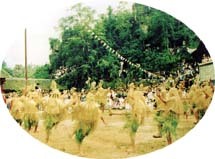 One of the earliest dances of the Tujia nationality. The dancers usually wear a tower-like cap, clothes made of rice straw and carry wooden sticks in their hands. Performance is usually accompanied by bamboo tubes. A kind of dance that is large in scale of the Yao nationality. One man and one woman (though sometimes two men and two women) makeup one dancing group. 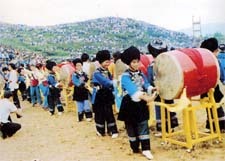 Their dance displays the labor, life and sacrifice activities of the Yao nationality.